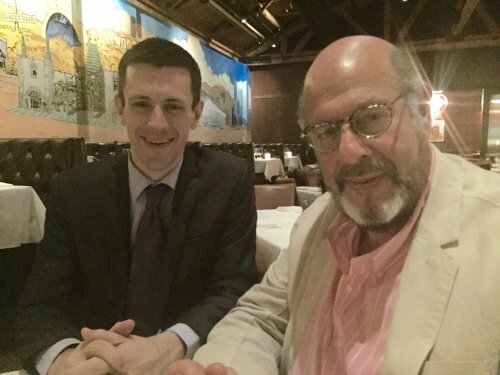 Fred Melamed looks like a serious man. 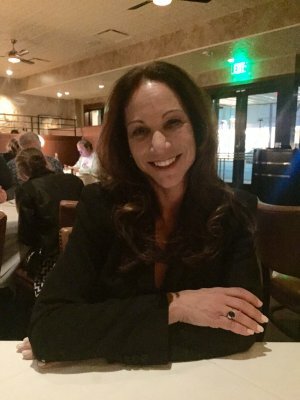 He walked into the Palm restaurant in Beverly Hills with gravitas, towering over other diners at over 6 feet and with a confident air about him. 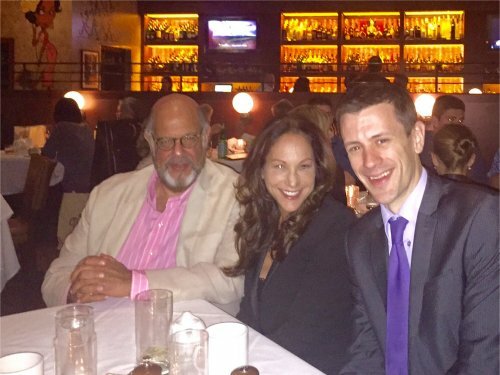 For a moment I thought I might be dining with a carbon copy of Sy Ableman, the pompous “villain” that Fred played in the Coen Brothers’ movie A Serious Man. But four hours later — after plenty of laughs, seeing him pose in a bib, hearing his cheeky joke about the Heimlich maneuver, and more — I’d learned that the real Fred is a serious but charming, smart, friendly and engaging man. And his wife Leslee is just as pleasant. I was in Los Angeles for a holiday and reached out to Fred, 59, for an interview. He suggested bringing along Leslee who could offer some insights into my questions about Fred’s career. From the beginning they both seemed at ease, and to an interviewer’s delight both had lengthy, interesting answers to my questions about life as an actor. 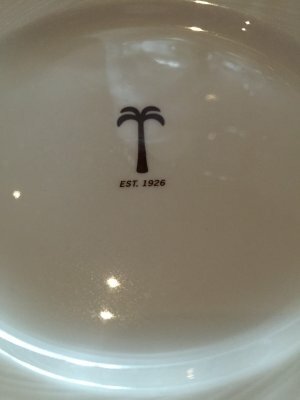 “Call me Fred,” he said, outstretching his hand to shake mine as we met inside the Palm, an upscale chain that offers steaks, seafood and some very strong cocktails. 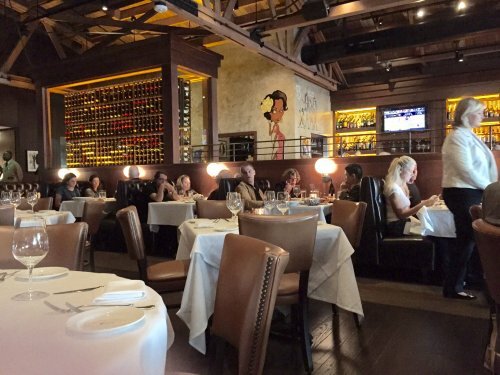 The restaurant looks like a typical steak house: low lighting, booths with comfy leather seats, wood lining the walls and ceilings. 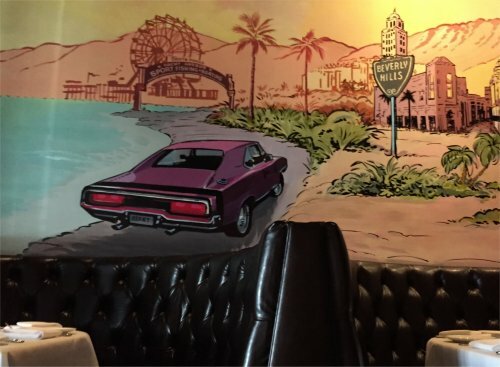 But the walls at the Palm in Beverly Hills are punctuated with cartoon portraits of some of the celebrity diners that have walked through its doors, as well as a colorful mural of Los Angeles scenery that lines an entire wall. 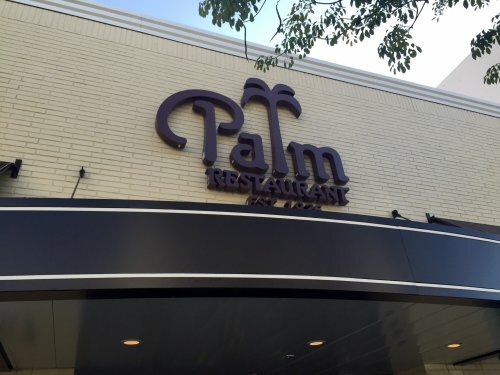 Fred said that he and Leslee used to dine frequently at the Palm in East Hampton when they lived in the tony coastal town of Montauk, New York. They only recently moved to Los Angeles, spurred in part because of Fred’s increasing travel to Hollywood for his work. After a few stage appearances when fresh out of drama school, Fred shifted to primarily working in the lucrative — but off-screen — voice-over industry. Throughout the 80s he made appearances in various television shows and movies, including several Woody Allen pictures. But A Serious Man was released in 2009, around the time he was looking to get into more on-screen acting, and the rave reviews for that performance have led to roles in shows such as Girls, House of Lies and Curb Your Enthusiasm and roles in movies such as In A World… in which he plays Sam Soto, voice-over artist and (not terribly great) father to a daughter who wants to work in the industry. Fred said that some viewers tend to associate him playing academic types (in Curb he was Larry David’s over-sharing psychiatrist) and that recently he’s had a run playing characters who are not very good fathers. So I wondered whether that makes him a character actor. So who is the “true” Fred under the coats? “God forbid, I’m the wrong person to ask,” he said, reaching for a sip of an Old Stone IPA. “It’s a constant source of surprise and often displeasure,” he said with a knowing grin. “That’s very nice of you to say,” Fred interjected, his voice breaking slightly. Leslee gave the smile of a patient wife who’s clearly used to playful back-and-forth with her husband. Then she continued. “What I’m saying is there’s an air of confidence which some might take as pomposity or arrogance. And that can be extremely unpleasant for them,” she said. And it’s those features, and Fred’s ability to use them in his roles, that make his characters like Sy Ableman or Sam Soto so memorable. Being memorable is Fred’s goal with his performances. “What I always aspire to is to haunt the audience,” he said. “You know when you see something that’s really good it insinuates itself into your consciousness, somewhere maybe between your conscious mind and some less conspicuous part of you. And you think about it, you replay it, you bounce it off various parts of your mind. It preoccupies you. I hope my work affects the audience on some level,” where viewers ponder what they’ve seen long after the credits roll. I asked how Fred manages to achieve his goal, and he admitted it’d be a long answer. 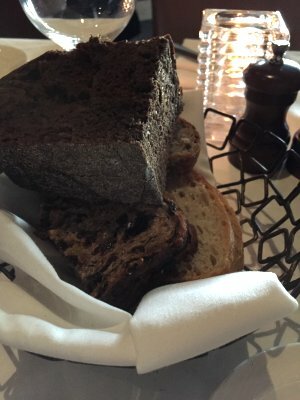 So I sat back in my chair, sippedan Old Fashioned, and picked at the various delicious slices of bread that our waiter brought out. He’s a huge proponent of fully preparing his roles, working for lengthy amounts of time to know the lines off by heart so he can focus on his delivery and his reactions to other actors. Fred smiled with recognition. “Happens all the time,” he said. After roughly a quarter-century in acting, Fred appears to have developed the skills necessary to meet the burden of lifting up a poorly written part — but also the reputation for nailing a greatly written part. But working in the movie industry was never a career goal that his parents encouraged. 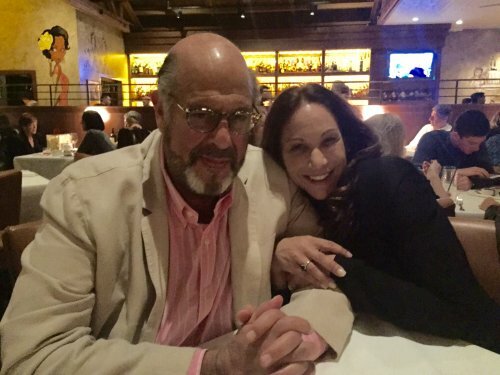 Fred said the tough relationship with his mother growing up is relevant to his acting, because it informs characters like Sy Ableman or Sam Soto — people who have such a sense of self-righteousness that they think if only the world would follow them and do what they say, everything will be fine. “That force in my childhood made me familiar with this idea of, ‘Don’t worry sweetheart, I know what’s best for you, even though I really want what’s best for me,’” he said. The Melameds lived in the Big Apple for a time until the family’s fortunes went south and they had to relocate for a while to Hollywood, Florida — meaning Fred has now lived in both Hollywoods, and he’s a much bigger fan of the one in California. “Fred had been living on the upper east side of Manhattan, going to a private prep school. Life was very sweet. So the move to Florida was very disorienting for him,” said Leslee. Forced busing and racial integration of schools had just started when Fred attended a huge high school in the Sunshine State, and the racial fights and tension at school were something he couldn’t understand or abide. But he only endured two years in Florida before escaping to the liberal arts Hampshire College in Amherst, Massachusetts. Fred had done some acting in plays written and directed by a friend, and he enjoyed it — though for perhaps different reasons to why others pursue such a career. “My father, who I was very close to, was a rather depressed man, and I think somehow I equated being an actor with raising his spirits, making life seem like a winnable proposition to him,” he said. But he also enjoyed the imaginative side of acting. “I liked the fact that I could experience things as an actor that in real life I would never know what’s it like to be in a war, or be a murderer, or a hero, or be romantic in ways that I was unlikely to in my real life. And one thing I liked — which I still like — is that acting is completely consuming of my consciousness. It so completely takes over my mind and my life, and I love that about it,” Fred added with a smile. After college, Fred went to the Yale School of Drama, where he met Tina Packer and Kristin Linklater, the founders of the Shakespeare & Company theater group. He worked with them for a while, and then after graduation immediately got a job at Minneapolis’ Guthrie Theater. He performed in various stage roles, including Amadeus on Broadway. It was during that 16-month extended run that he developed what he calls a “terrible” stage fright. “I felt bad that this was such a wonderful play and a good part, but I was taking so much effort to get myself through I didn’t think I was giving a good performance,” Fred said. And he can’t pinpoint where the fright started, just that it made him hate acting on stage. So he decided to quit theater acting and instead started to work in the lucrative voice-over industry. He would occasionally do movie acting if called on, for example, by Woody Allen’s casting director — who knew Fred from auditions years ago — for roles in some of his 1980s movies. “But I had no real deep need to do it,” he said. What was it that made Fred reignite his passion for on-screen acting? Before I could find out the answer to our question, our attentive waiter had returned with our platter of starters. As he set down the several plates, I was impressed with the size of the dishes. 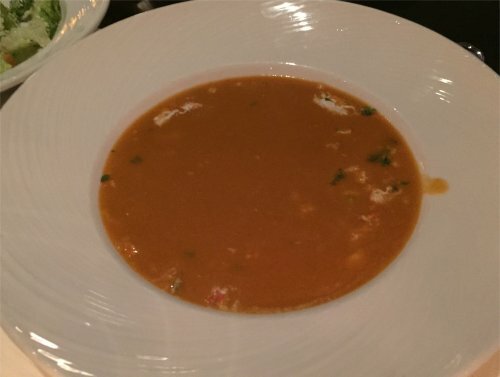 Leslee opted for the lobster bisque with fresh lobster meat, cream and sherry, a huge bowl. It looked great, although I declined her offer to try it. 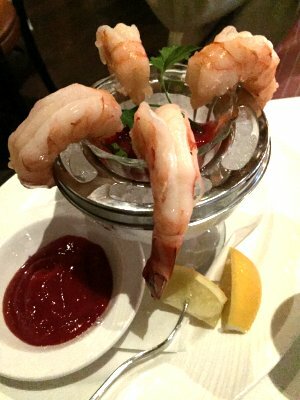 Along with the Caesar salad, Fred also ordered a jumbo shrimp cocktail. “I would suggest having one of these, they’re very good,” he said to me as he settled the plate between us. I tried one of the shrimp, and realized his assessment was spot-on. The massive, meaty shrimp was fresh and not at all rubbery, complemented by the perfect horseradish sauce. 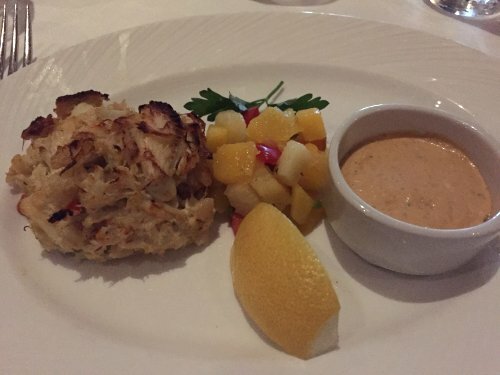 But I also had own starter of crab cake to contend with. It was a single, baseball-sized crab cake served with chipotle tartar sauce. 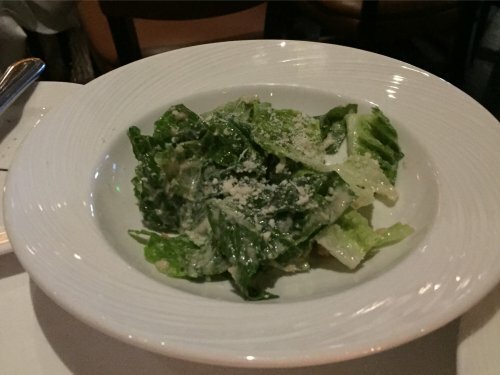 When I’d been pondering ordering it, Fred said he’d tried it before and it was “good but not the best I’ve ever had.” Again, I had to agree with his analysis. The crab inside the cake was fresh and flaky, and the tangy sauce gave the dish a nice kick, but there wasn’t anything memorable about it. Nevertheless the crab cake plus the shrimp was more than enough food to contend with, so as I ate with vigor, Fred explained how he got his vigor for acting back. A friend asked Fred if money were no object, what would he like to do? He thought about it and realized he wanted to get back into acting. He tried and gave himself one year to succeed before having to take a 9 to 5 job to pay the bills. Initially he had “no great” success. But then one day he was sitting at home in Montauk, and the phone rang. Leslee answered the call. “Do you know a Joel Coen?” she recalls shouting to him. Having not worked much, Fred was glad to read the script and jumped at the chance to take the role. But silence followed. Many months passed as the Coens went to work on other movies, including No Country for Old Men. Fred started to worry. It was coming up to the end of the year he’d given himself to make it in Hollywood. “And they all of a sudden they call me again and say that A Serious Man is back on,” Fred said. So he packed his bags for the shoot in Minneapolis. Giving an example of the amount of thought he puts into preparing roles, Fred said he considered Sy’s motives. “I think that he did want to take over Larry’s marriage, his house, his kids, but I think he also believed that if everyone did things the way he wanted, the world would be better. I think he was sincere there. Because after all, what is evil? Evil is just selfishness, I think very few people set out to be bad. It’s just that their view of things is so narcissistic that if everyone does things they have in mind, the world will be better for everyone,” Fred said. “I think because I had a significant amount of that come my way in my childhood and also because my presence is rather large and perhaps overbearing, I think I’m particularly effective in those kinds of roles,” he added with a chuckle. Overbearing self-belief was also one of the defining characteristics of Sam Soto, the voice-over artist in In A World… who has zero interest in encouraging his daughter’s career in the industry. “That was a movie that I loved making. I think there’s something resonant to me because of my own personal experience about playing characters who are selfish but tend to want to mask their selfishness in this hail-fellow-well-met friendlessness,” Fred said. He didn’t know writer-director Lake Bell, who also played the daughter’s role. Instead Fred received a call from his agent saying Lake had written the role with him in mind, along with what Fred called a “beautiful” handwritten note asking if he’d be interested. Fred and Lake met in New York and clicked, and he jumped at the chance to take on the part. There’s one scene in the movie that I thought might help explain how Fred puts his acting into practice. Sam is hosting a dinner with his two on-screen daughters — Lake and actress Michaela Watkins — as well as his girlfriend who is about 30 years Sam’s junior. It’s during dinner that it becomes clear to Sam that Lake’s character is sleeping with Sam’s male protege in the voice-over industry. The camera fixes on Sam as his face and body contorts into something that looks like a nuclear meltdown of the brain. It’s a 10 to 15 second wordless moment, but incredibly effective. “Here I was having everyone over for dinner, thinking I’d be the big daddy host. But instead I get a lot of unpleasant surprises,” Fred said. “So I thought that when this reality dawns on him, he can’t breathe, he can’t swallow,” he added. At the time he said he was heavily invested in the moment, having learned his lines off by heart. That meant he could put all his acting focus into how Sam should react to the bad news he’s hearing. And Fred’s right, that scene sticks in the memory. He then confided that he had some help from his own life. “I have this thing — you may see it tonight — where I sort of choke on my food. I probably eat too fast,” he said. “Don’t worry about it,” said Leslee with a smile. I suggested that I might have to perform the Heimlich maneuver on Fred, which prompted him to tell a bawdy joke that should probably best stay at that dinner table. As our laughter died down, our waiter returned with our main courses. “Careful, I might get lobster in your tape recorder,” Fred joked, as he took his bib for eating lobster from the waiter and attached it around his neck. While the waiter set our plates down, Fred added that he is a huge fan of the Coen Brothers and of Lake Bell, and is grateful for the roles in both their movies. He beamed as he recounted how he went from thinking about having to quit acting outright to his current busy schedule. “Many times in life when there’s a crisis, you think it’s the end of world and things are very unpromising. It turns out it’s the start of a new chapter, and that’s very wonderful,” he said. Click on this link to read part two of my interview with Fred and Leslee.